Boston Celtics forward Jared Sullinger (7) grabs a rebound against Milwaukee Bucks guard Giannis Antetokounmpo (34) and forward John Henson (31) in the 4th quarter at BMO Harris Bradley Center. The Celtics have lost three in a row and haven’t looked good. The Cavs have lost five of six and looked even worse. The Celtics hammered the Cavs by 17 points the last time they played (Nov. 29 at Boston). It’s hard to tell if the Cavs are actually any better. Maybe playing a matinee game will wake them up. They’d better hope so, because a Celtics team that was expected to tank may actually challenge the Cavs for a playoff spot. That is, if the Cavs can get their act together long enough to think about the postseason. * In an NBA season full of major injuries to big-name stars, the Cavs have remained relatively healthy. Yet they don’t have a lot to show for it. The Celtics, of course, are still without All-Star PG Rajon Rondo. * The Cavs and Celtics don’t play again until April 12 at Quicken Loans Arena. It’s the C’s lone visit there this season. 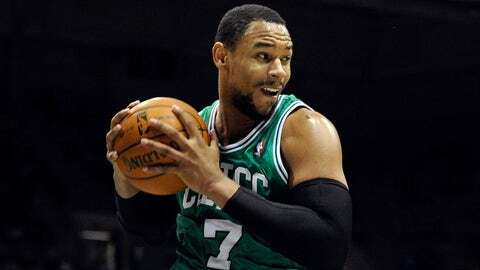 * Former Ohio State standout Sullinger is faring well in his second pro season. The Celtics’ big man is averaging 15.5 points and 7.9 rebounds in his 17 starts. He scored 12 points (all on 3-pointers) in the teams’ first meeting. * Celtics coach Brad Stevens (37 years old) is the youngest coach in the NBA, but that doesn’t really matter. The late Red Auerbach was just 33 when he took over the team in 1950-51. He later guided Boston to 11 titles. * The Cavs made a season-high 49 field goals Thursday vs. Atlanta. In typical Cleveland fashion, it was still a loss. * Cavs G Dion Waiters has scored 20 or more in seven of his previous 11 appearances. He returned from a three-game absence (casued by wrist tendinitis) to tally 20 against the Hawks.